Wednesday evening in a stream of sparks and burning tires. No one was hurt. Federal authorities, the airline and the plane manufacturer launched investigations. Varma, 23, and other passengers said the plane's monitors carried live DirectTV broadcasts on the plane's problems until just a few minutes before landing at Los Angeles International Airport. The landing gear trouble — the front wheels were stuck in a sideways position — was discovered almost immediately after the plane departed Bob Hope Airport in Burbank at 3:17 p.m., en route to New York City. The Airbus A320 circled the Long Beach Airport, about 30 miles south of Burbank, before being cleared to land at Los Angeles. It stayed in flight for three hours to burn off fuel, said Federal Aviation Administration spokesman Donn Walker. CBS News correspondent Jerry Bowen reports that as dramatic as the three hour odyssey was, its cause may have been a simple maintenance mistake, according to aviation experts. If so, it is not the first time it has happened on the Airbus 320, reports Bowen: Since 1999, there have been at least six similar incidents -- four in the United States, including another JetBlue plane. to watch his plane's fate being discussed on live TV while it was in the air. At one point, he said, he tried to call his family, but his cell phone call wouldn't go through. "I wanted to call my dad to tell him I'm alive so far," the 27-year-old musician said. The pilot finally brought the plane down, back wheels first. 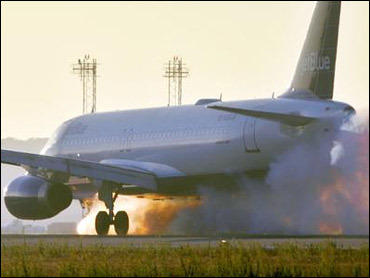 As he slowly lowered the nose gear, the stuck wheels erupted in smoke and flames, which quickly burned out. "At the end it was the worst because you didn't know if it was going to work, if we would catch fire. It was very scary. Grown men were crying," said Diane Hamilton, 32, a television graphics specialist. As the plane was about to touch the ground, Hamilton said crew members ordered people to assume a crash position, putting their heads between their knees. "They would yell, "Brace! Brace! Brace!"' she said. "I thought this would be it." Lisa Schiff, 34, of Los Angeles sent a text message to her mother in Miami that said: "I love you. Don't worry about me. If something happens, know that I am watching you and Daddy and (her brother) David." Emergency crews from across the area met the plane on the runway. Spectators gathered on buildings and stood on parked cars to see firsthand as passengers walked down a stairway onto the tarmac with their carryon luggage. Some passengers shook hands with emergency workers and waved to cameras. One firefighter carrying a boy across the tarmac put his helmet on the child's head. "We all cheered. I was bawling. I cried so much," said Christine Lund, 25, who was traveling with her cat. She and the other passengers were taken by bus from the tarmac to the airport's international terminal. The plane was towed to a hangar, and the runway where it touched down was closed for about three hours, but no flights were delayed or canceled, officials said. The cockpit voice recorder and digital flight data recorder — the so-called black boxes — were removed from the airplane and secured by the investigator in charge, the NTSB said Thursday. JetBlue spokeswoman Jenny Dervin said the airline was investigating the incident with the FAA and National Transportation Safety Board. She declined to identify the pilot and first officer. On Thursday, a JetBlue airliner departing from Tampa, Fla., landed safely at John F. Kennedy International Airport after its pilot reported a problem with the wing flaps as the plane prepared to descend, Dervin said. No injuries were reported. It was unclear if the flaps actually were locked or if it was a false alarm. About 57 of the passengers from Wednesday were placed on another flight, which arrived at New York's Kennedy Airport at 6:05 a.m. EDT Thursday, said airline spokeswoman Sharon Jones. Others were put up in hotels and given reservations for Thursday flights. Still others simply returned home. Among the latter group was Varma, who was greeted by her parents at the terminal. "It started out just being a ghastly birthday, but now it's just fabulous, " said her father, Anil, who turned 51 on Wednesday. Airbus spokeswoman Mary Anne Greczyn said the company is working closely with JetBlue to determine exactly why what happened. "While rotated nose landing gear is uncommon, it has happened in the past, with a similar outcome — safe landing, no injuries," Greczyn said in an e-mail. "Last night's incident concluded exactly as Airbus expected it would. Flight crews are trained to handle such situations and aircraft are designed to withstand such landings." JetBlue, based in New York, is a five-year-old low-fare airline with 286 flights a day and destinations in 13 states and the Caribbean. It operates a fleet of 81 A320s.